As a boy on his father's farm, Captain Norman Bell dreamed of going to sea. When his father finally gives in to his pleas, he joins the Hain Steamship Company at the start of what is to be a long and varied career at sea. 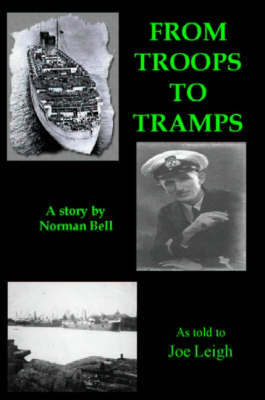 In 'Troops and Tramps' the captain recounts his exploits on board cargo ships, luxury liners, troopships, colliers - all in vivid detail and with varying degrees of affection. He relates amusing anecdotes about his superiors and colleagues and his run-ins with the 'powers that be'. "Ours is not to reason why" was a favourite saying, but he did not always abide by it. As he looks back, he re-lives the excitement and danger of life at sea during the Second World War, when he had to sail back and forth across the oceans at the mercy of enemy torpedoes, submarines and mines. He recalls after many spectacular near misses, one very lucky escape. The captain's story provides a glimpse of wartime Britain and the hardships suffered - the Blitz, the doodlebugs, the V-2 rockets. It is an exciting account, all the more thrilling because it is told by one who experienced it first hand and, against all the odds, survived.